After celebrating its 100th birthday last year, Oreo kicked off 2013 by marking another milestone–the debut of the brand’s first-ever Super Bowl commercial. 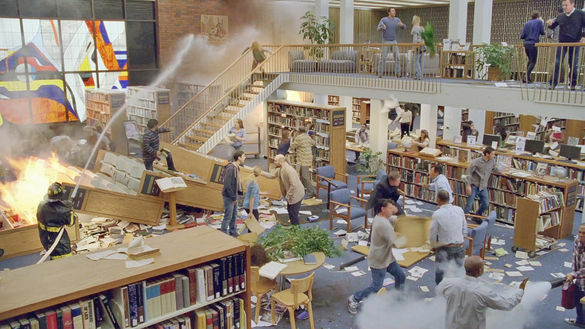 In “Whisper Fight,” created by Wieden + Kennedy and directed by MJZ’s Tom Kuntz, all hell breaks loose in a library after two guys disagree over whether the cookie or the creme is the best part of an Oreo (Oreo’s parent company, Mondelez International, was known as Kraft Foods Inc. until a company split and name change last year). The debate devolves into a brawl, and other library patrons join in. The battle spins out of control, with chairs flying, bookshelves knocked over and a microfiche reader hurled through a window, but not one person’s voice rises about a soft, hushed tone–they are in a library, after all! The spot is an over-the-top portrayal of what can happen when Oreo lovers disagree, but the premise has roots in the real world. Through social media (Oreo has nearly 32 million Facebook followers, by the way), the brand observed that fans were routinely asking each other, “Do you like the cookie, or do you like the creme?” And Oreo saw the Super Bowl as an opportunity to not only portray that debate in a fun way, and inspire even more of it. At the end of “Whisper Fight,” viewers are directed to Oreo’s Instagram page where they are asked to make their preference known by submitting photos hashtagged with #cookiethis or #cremethis. In the next couple of days, Oreo will select the best submissions, then commission artists to create sculptures based on the images. These Oreo-inspired works of art will be photographed and shared via Instagram. Oreo will continue the collaboration with Wieden + Kennedy for at least one post-Super Bowl ad. In addition to the Super Bowl campaign, there was a second idea that the agency put forward that will likely come to fruition in March, according to an Oreo spokesperson. Look for the second spot to start running across major cable channels beginning March 11. In the meantime, the cookie versus creme campaign will be supported by owned media, digital and mobile ads, public relations efforts and in-store point-of-sale promotions. “Whisper Fight” ad was shot in an empty airport terminal in Ontario, California and the “library” depicted is a set built from the ground up.